Tonight in NYC Top Spin Charity Celebrity Tournament. NEW YORK, Dec. 2, 2015 — TopSpin Charity continues to support youth education in New York City with its charity table tennis tournament on Wednesday, Dec. 9, from 6:30-11:30 p.m. at Metropolitan Pavilion in Manhattan. Tickets for the seventh-annual event are now on sale, $135 for event entry and $235 for table tennis tournament entry at www.topspincharity.org. 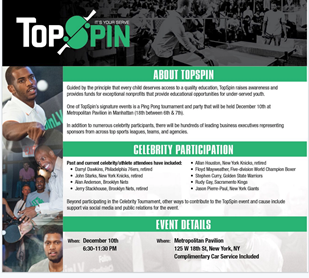 TopSpin, a national philanthropic group, dedicated to empowering America’s youth through education, will bring together more than 1,300 members of the sports and entertainment industries, including top sports executives and athletes from New York-based professional teams. "TopSpin strives to make an even greater impact each year for an amazing group of nonprofits working with young people in New York City," said Peter Farnsworth, Founder of TopSpin Charity. “It's always so motivating and impressive to see how executives from across the professional sports leagues, area teams and leading media companies and agencies come together to make such an incredible contribution." This year’s event boasts two, elevated stadium courts, which will play host to the Celebrity Tournament – featuring professional athletes and celebrities from New York City – and the Professional Division – highlighted byeight players from USA Table Tennis, including U.S. Olympic Team member, Yue Wu and four-time Paralympian, Tahl Leibovitz. A number of retired professional basketball players including, John Wallace, John Starks, Vin Baker and Larry Johnson; Chris McCullough and Rondae Hollis-Jefferson of the Brooklyn Nets; NBA player, Willie Green and Leger Douzable of the New York Jets are expected to play in the celebrity tournament. The event will also have an Open Division in which participants can now register. Winners of each Division will receive official TopSpin trophies from Tiffany and products by JBL. "The proper education can take a kid far in life and enable them to reach their goals," said Hollis-Jefferson. "I really admire and appreciate what TopSpin is doing for today's youth. For them to put so much time and effort into helping kids reach their goals is really something special and I'm grateful to be a part of it this year." The charity event will bring more than 15 of New York’s top restaurants together, offering an unprecedented catering variety. The event will have a Coca-Cola Lounge, Effen Vodka bar and two satellite bars. Additional event elements include an experience by PhotoTap, and a silent auction in partnership with Grandstand Sports & Memorabilia. A Better Chance – FM: A Better Chance, TopSpin’s flagship beneficiary, recruits academically talented students of color from disadvantaged school districts and places them in an outstanding public school inFayetteville-Manlius. Horizons – BFS (Brooklyn Friends School): Horizons at Brooklyn Friends School is an academic enrichment program designed to serve kindergarten through eighth grade children from low-income families living in downtown Brooklyn. Prep for Prep: Prep for Prep identifies New York City’s most promising minority students and prepares them for placement at independent schools in the city and throughout the Northeast. A testament to the industry’s commitment to TopSpin’s movement, the TopSpin Charity Host Committee is made up of leading industry executives, including: Brian Gordon of Engine Shop, Charlie Horsey of MKTG, CliffKaplan of Equity Sports Partners, Emilio Collins and Mark Tatum of the NBA, Jim O’Connell of NASCAR, Jon Diament and Will Funk of Turner Broadcasting, Ron Skotarczak of MSG, Sean Hanrahan of ESPN, Tom Glick of Manchester City Football Group, Dan Donnelly of Starcom Mediavest Group, Dave McNaughton of Williams Forrest, Jeff Shifrin of Octagon, Todd Goldstein of AEG, Leslie Gittess of Blue Sky Media, Brian Levine of Goldman Sachs and Tandy O’Donoghue of WWE. TopSpin Charity is proud to be affiliated with numerous corporate supporters from across the sports and entertainment industry, including MKTG INC, a global lifestyle marketing agency that has been producing the TopSpin event for the last five years, as well as Williams-Forrest, TopSpin’s digital services partner. Sponsors of TopSpin include sports leagues media entities and premium brands, including: Harman International, American Express, Coca-Cola, NFL, MLS, MSG, Atlanta Dream, AEG, Wasserman Foundation, Octagon, EXL, NHL, NYCFC, Equity Sports Partners, Anheuser-Busch, Tiffany, Getty Images and Beam Suntory. TopSpin was founded in 2009 guided by the principle that every child deserves access to a quality education. TopSpin seeks to provide necessary resources for underserved youth to succeed. Since inception, TopSpin has quickly grown into one of New York’s premiere sports, entertainment and media industry events, attracting over 7,000 influencers and executives while raising more than $2,000,000 for 18 nonprofit organizations. To learn more aboutTopSpin and its work to date, please visit www.topspincharity.org, and follow us on social media via our Facebook page (www.facebook.com/TopSpinCharity), Twitter @TopSpinCharity and Instagram @TopSpinCharity. The tournament is going to be a great hit.